Starting a new business or want to redecorate your office? How your employees and clients interact in your working environment is important. This could either make everything work like clockwork or be a disaster. Layout is also something to think about when planning where everything should go. Let Decor8 Hong Kong furniture help you create a stylish workspace for your interior. 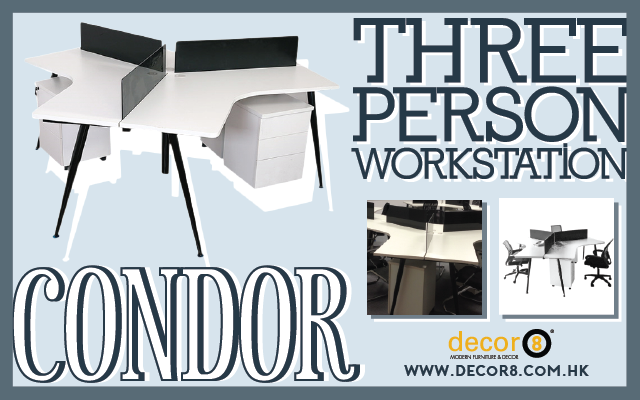 Today we will focus on the Condor Modern Office Three Person Workstation. This looks great as a standalone unit or you could group a few together. As an added perk to this table, you can choose to add storage cabinets so that your employees can store paperwork and essentials in there. With lots of paperwork and a rushed office environment, you’ll want a table that is sturdy but this doesn’t mean you have to sacrifice style for a table of this kind. The Condor Modern Office Three Person Workstation is both stylish and built to withstand the harsh office life. This table is made with a solid steel frame painted in black. The top surface is made of MDF wood with a white veneer finish. Each side is separated with a transparent divider to define each person’s workspace. Overall this table will give any office a modern look and make it look more aesthetically pleasing. No desk is complete without chairs so why not browse our collection of office chairs at our Decor8 furniture website. You could even drop by our showrooms to view and test a selection of our office chairs. The great thing about the Condor Three Person Workstation is that it uses neutral colours, which makes it adaptable in any office environment. This is perfect when you are trying to decide what chairs you want in your space whether you choose to add colourful office chairs or standard chairs. Get styling and create a fun work place to stimulate your employee’s minds to help move your business forward. This entry was posted in Study and Work Desks, Tables and tagged modern office furniture, office chairs, office furniture, office furniture hong kong, office storage, office table, office work desk, steel office table, Three Person Workstation, work desk.